The world's ninth-biggest country is one of its last great travel unknowns. Though the outside world is gradually becoming aware of Kazakhstan, largely thanks to its oil and the antics of that pseudo-Kazakh Borat Sagdiyev, few have explored this country of vastly varied attractions. The most economically advanced of the 'stans', post-Soviet Kazakhstan is reinventing itself as a uniquely prosperous and modern Eurasian nation. The leafy commercial and social hub, Almaty, has an almost European feel with its quality hotels, slick boutiques, chic cafes and luxurious cars. Astana, in the north, is being transformed at quickfire speed into a 21st-century capital with a mix of Islamic, Western, Soviet and wacky futuristic architecture. President Nazarbaev, who's ruled Kazakhstan since Soviet times, doesn't encourage political opposition but is managing to forge a peaceful, multiethnic nation - which makes him on the whole pretty popular. Around the great steppes where the once nomadic Kazakh people - still famed for their horse skills - used to roam, Kazakhstan presents an array of adventures. You can trek on foot or horse in the spectacular Tian Shan or Altay Mountains, watch flamingos on steppe lakes or discover mysterious underground mosques near the Caspian Sea. Ecotourism programs in some of the most beautiful areas enable travelers to stay with village families at affordable cost. With travellers still rare here, a foreign guest is usually treated not as just another tourist but with real hospitality, and locals will often go out of their way to help you. Enjoy it while it lasts! The early history of Kazakhstan is a shadowy procession of nomadic empires, most of whom swept into the region from the east and left few records. Recurring themes down the millennia include a great deal of large-scale slaughter and a contrast between Kazakhstan's far south, which was within the ambit of the settled Silk Road civilisations of Transoxi-ana (between the Syr-Darya and Amu-Darya rivers), and the rest of the country, which remained the domain of nomadic horseback animal herders until the 20th century. By around 500 BC southern Kazakhstan was inhabited by the Saka (Scythian), a nomadic people who are considered part of the vast network of Scythian cultures that stretched across the steppes from the Altay to Ukraine. The Saka left many burial mounds, in some of which fabulous relics have been found - above all, the Golden Man (see pi 19), a superb warrior's costume discovered near Almaty which has become a national symbol. Around AD 1130 the Karakhanids were displaced by the Khitans, a Buddhist people driven out of Mongolia and northern China. The Central Asian state set up by the Khitans, known as the Karakitay empire, stretched from Xinjiang to Transoxiana but in the early 13th century it became prey to rising powers at both extremities. To the west was the Kho-rezmshah empire, based in Khorezm, south of the Aral Sea. In 1210 the Khorezmshah Mohammed II conquered Transoxiana. To the east was Jenghiz Khan, who sent an army to crush the Karakitay in 1218, then turned to the Khorezmshah empire, which had misguidedly rebuffed his relatively peaceable overtures by murdering 450 of his merchants at Otrar. The biggest Mongol army in history (150,000 or more) sacked Samarkand, Bukhara and Otrar, then carried on westwards to Europe and the Middle East. All of Kazakhstan, like the rest of Central Asia, became part of the Mongol empire. On Jenghiz Khan's death in 1227, his enormous empire was divided between his sons. The lands most distant from the Mongol heartland - from the Aral Sea to Ukraine and Moscow - went to the descendants of his eldest son Jochi and came to be known as the Golden Horde. The bulk of Kazakhstan went to Jenghiz Khan's second son Chaghatai, and became known as the Chaghatai khanate. In the late 14th century far southern Kazakhstan was conquered by Timur from Samarkand. The Kazakh people, descendants of the Mongols and of peoples who survived their conquest, did not emerge as a distinct group until the 15th century. The story actually starts with the Uzbeks, a group of Islamised Mongols named after a 14th-century leader Ozbeg (Uzbek), who were left in control of northern Kazakhstan as the Golden Horde disintegrated in the 15th century. In 1468 an internal feud split the Uzbeks into two groups. Those who ended up south of the Syr-Darya ruled from Bukhara as the Shaybanid dynasty and ultimately gave their name to modern Uzbekistan. Those who stayed north remained nomadic and became the Kazakhs, taking their name from a Turkic word meaning free rider, adventurer or outlaw. In the late 15th and 16th centuries the Kazakhs established one of the last great nomadic empires, stretching across the steppe and desert north, east and west of the Syr-Darya. They even briefly ruled a chunk of Siberia from Sibir (modern Tobolsk) from 1563 to 1582. The three Kazakh hordes that had emerged -with which Kazakhs today still identify - were the Great (or Elder) Horde in the south, the Middle Horde in the centre and northeast, and the Little (or Young or Lesser) Horde in the west Each was ruled by a khan and composed of a number of clans whose leaders held the title axial, bi or batyr. Despite their military prowess, the three clans failed to unite against danger, and were defeated first by the Zhungars (Oyrats), a warlike Mongol dan who subjugated eastern Kazakhstan between 1690 and 1720 (the 'Great Disaster'), and later by the Russians. Russia's expansion across Siberia ran up against the Zhungars, against whom they built a line of forts along the Kazakhs' northern border. The Kazakhs sought tsarist protection from the Zhungars, and the khans of all three hordes swore loyalty to the Russian crown between 1731 and 1742. Russia later chose to interpret these oaths as agreements to annexation, and gradually extended its 'protection' of the khanates to their ultimate abolition. Despite repeated Kazakh uprisings, notably by Abylay Khan's grandson Kenisary Qasimov in the 1840s, Russia steadily tightened its grip. The revolts were brutally suppressed. By some estimates one million of the four million Kazakhs died in revolts and famines before 1870. Meanwhile, movement of peasant settlers into Kazakhstan was stimulated by the abolition of serfdom in Russia and Ukraine in 1861. The tsarist regime also used Kazakhstan as a place of exile for dissidents - among them Fyodor Dostoevsky and the Ukrainian nationalist writer and artist Taras Shevchenko. In 1916 Russian mobilisation of Kazakhs as support labour behind the WWI front caused a widespread uprising. It was brutally quashed, with an estimated 150,000 Kazakhs killed and perhaps 200,000 fleeing to China. In the chaos following the Russian Revolution of 1917, a Kazakh nationalist party, Alash Orda, tried to establish an independent government. Alash Orda's leader was Ali Khan Bukeykhanov, a prince and descendant of Jenghiz Khan, and ultimately a victim of Stalin's 1930s purges. As the Russian civil war raged across Kazakhstan, Alash Orda eventually sided with the Bolsheviks who emerged victorious in 1920 -only for Alash members soon to be purged from the Communist Party of Kazakhstan (CPK). Meanwhile many thousands more Kazakhs and Russian peasants had died in the civil war, which devastated the land and economy, and several hundred thousand fled to China and elsewhere. The next disaster to befall the Kazakhs was denomadisation, which began in the late 1920s. The world's biggest group of semi-nomadic people was pushed one step up the Marxist evolutionary ladder to become settled farmers in new collectives. They slaughtered their herds rather than hand them over to state control and, unused to agriculture, died in their hundreds of thousands from famine and disease. Those who opposed collectivisation were sent to labour camps or killed. Kazakhstan's population fell by more than two million between 1926 and 1933. In the 1930s and '40s more and more people from other parts of the USSR, prisoners and otherwise, were sent to work in new industrial towns and labour camps in Kazakhstan. Camp inmates included entire peoples deported en masse from western areas of the USSR around the time of WWII. A further wave of around 800,000 migrants arrived in the 1950s when Nikita Khrushchev decided to plough up 250,000 sq km of north Kazakhstan steppe to grow wheat in the Virgin Lands scheme (see pill). Although the labour camps were wound down in the mid-1950s, many survivors stayed on. Yet more Russians, Ukrainians and other Soviet nationalities arrived to mine and process Kazakhstan's reserves of coal, iron and oil. 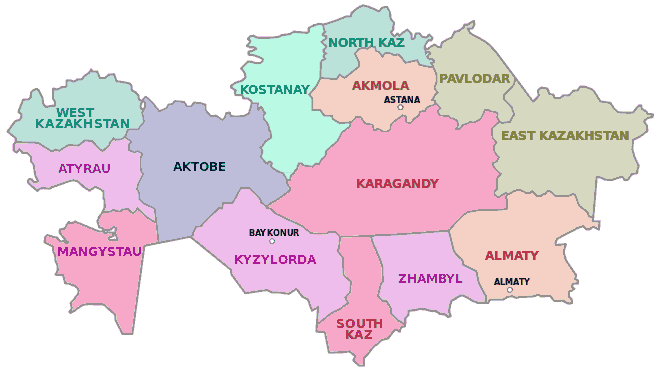 The population of Kazakhs in Kazakhstan dwindled to less than 30%. The CPK's leader from 1964 to 1986 was a Kazakh named Dinmukhamed Kunaev. Although he was corrupt, Kunaev's replacement by a Russian, Gennady Kolbin, in 1986 provoked big demonstrations and violent riots in many cities. During the Cold War the USSR decided Kazakhstan was 'empty" and 'remote' enough to use for its chief nuclear bomb testing ground (the Semipalatinsk Polygon; see pill) and its space launch centre (the Baykonur Cosmodrome, see pl50). In 1989 Kazakhstan produced the first great popular protest movement the USSR had seen: the Nevada-Semey (Semipalatinsk) Movement, which forced an end to nuclear tests in Kazakhstan. The people of Kazakistan have great interest in foreign travel they travel all over the world. In Dubai you can find Kazakistani people having their permanent abodes in the many freehold properties, some go there for business some go the for business. The Arab culture and environment has great influence on the Kazak people. Kazakh clothing is often made of different material that suit region's hot summers and cold winters and reflect social standing; contemporary Kazakhs, although most of the people in Kazakhistan western dresses, but traditional clothing are worn for holidays and on special occasions. Kazakhstan is famous for traditional knives, there are many places in Almaty where people sell antique knives that are not only exotic but are also effective. If you are looking for throwing knives then click here . You will find knives of all types available for you online, they also sell Kazakh Kives and daggers for decoration. Kazakstan's ruggesd mountain communities live a healthy life and live much longer than the cities. The organic food that is available in mountains and valleys is the main staple food that people eat in the villages surrounding the cities. The natural way of life and vegitable diets can increase the life expectancy in humans, many people take medicines, vitamin suppliments and seroids to increase the muscle generation and body texture, A website like www.myhealthyoutlet.com/blog/how-to-correctly-use-supplements-to-increase-testosterone-levels/ will provide you with the highest quality in the industry. Gold is the commodity that Kazakhs use as their jewelry as well as a form of saving, there are lot of ways to keep gold for safty and for investment, Are you looking for "gold dealers"? Check out buy-gold The passionate experts in this field are ready to answer all of your requests. click on the blue link to know more about the gold purchases and latest rates in the market. In central Asia Kazakhstan Glass has always been ideal material for a water pipe because of its heat resistance, transparency and the endless ways it can be shaped and colored. For bongs, Glass never adds any unwanted flavor to smoke and with proper care and regular cleaning, your glass pipe will last you as long it is not dropped or broken. Only high-quality borosilicate glass must be used to make the bongs read the info for a reliable online head shop that will give you the info about glass bongs for sale you're looking for quickly and easily. If you are looking for Orange County DUI Lawyer then learn more . Sentient Lasers provides a lot of information on aesthetic lasers at http://sentientlasers.com . You'll learn about different laser brands and what is available for medical practices. Are you looking for "Refrigerator repair in Los Angeles County"? Check out tophomeappliancerepair The passionate experts in this field are ready to answer all of your requests.